Pickford Film Center & Village Books present "Writers in the Limelight." Join us for the screening of lectures and presentations from some of the most celebrated voices in the humanities, arts, and sciences. Watch author Thomas Buergenthal discuss his book, A Lucky Child: A Memoir of Surviving Auschwitz as a Young Boy, in this special movie showing at the Pickford Film Center's Limelight Cinema. (Author is not attending this event). Tickets are $6 and are available through the Pickford Film Center. Village Books will host a discussion after the showing and will provide books for sale at the event. THOMAS BUERGENTHAL discusses A Lucky Child: A Memoir of Surviving Auschwitz as a Young Boy. Thomas Buergenthal er dommer i Den internasjonale domstolen i Haag og en av verdens fremste internasjonale jurister og menneskerettsforkjempere. Thomas Buergenthal er født i 1934 i den slovakiske landsbyen Lubochna. Etter krigen studerte han jus ved New York University og Harvard, der han spesialiserte seg på internasjonal rett og menneskerettigheter. Han har vært professor ved en rekke velrenommerte universiteter, han har hatt en rekke høye akademiske verv og mottatt mange priser. Fra 1979 til 1991 var han dommer i den Inter-amerikanske domstolen for menneskerettigheter i Costa Rica. Fra 1992 til 1993 var han medlem av FNs sannhetskommisjon for El Salvador. Mellom 1995 og 1999 satt han i FNs menneskerettighetskomite. Fra år 2000 er han dommer i Den internasjonale domstolen i Haag. Han har skrevet en rekke bøker og artikler om internasjonal rett og menneskerettigheter. Thomas Buergenthal was born to a German Jewish family that had moved to Lubochna, Czechoslovakia to escape the Nazi regime in Germany. In 1938, Slovak soldiers who sided with Hitler took over the family's small hotel and the Buergenthals fled to the nearby city of Zilina, where they stayed until Thomas was 5 years old. Then his father took them across the border into Poland. On September 1, 1939, they boarded a train heading for a boat that would take them to England. But that day, the German Army invaded Poland, and their train was bombed. Joining other refugees, they walked north to Kielce, Poland. Buergenthal spent his childhood in the Ghetto of Kielce and in the concentration camps at Auschwitz and Sachsenhausen. With the help of a few adults, he survived to be liberated by the Red Army in 1945. In 1952, at age 17, he went to the USA and studied law at New York University and Harvard University, specializing in international law and human rights. He became a professor of law at a number of prestigious universities, the dean of Washington College of Law at American University, and one of the world's foremost international lawyers and defenders of human rights. From 1979 to 1991, he was a judge of the Inter-American Human Rights Court in Costa Rica. From 1992 to 1993, he was a member of the United Nations Truth Commission for El Salvador. 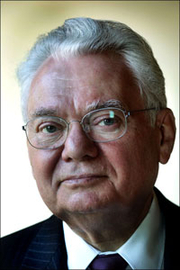 Between 1995 and 1999, he was on the UN Human Rights Committee. From 2000 to 2010, he served a judge in the International Court of Justice in The Hague . He has written a number of books and articles on international law and human rights. His memoir, A Lucky Child: A Memoir of Surviving Auschwitz as a Young Boy, was published in 2009. Thomas Buergenthal's book A LUCKY CHILD was available from LibraryThing Early Reviewers. Thomas Buergenthal is currently considered a "single author." If one or more works are by a distinct, homonymous authors, go ahead and split the author. Thomas Buergenthal is composed of 2 names. You can examine and separate out names.